As soon as you walk into the Kosmos Performance Space, you think you’ve wandered into some sort of madcap museum rather than a theater. The Kosmos is a funky space, commonly known for hosting the hip and earthy “Church of Beethoven.” Immediately, the scope strikes something of a unique mood: red brick and steel factory mods spider across the open expanse of ceiling. It’s industrial and airy, displaying a bustling lived-in mess everywhere in sight. But don’t worry if you’re not familiar with the Greek tragedy, or even if you’re wondering why Euripides might have written about a hippopotamus. It’s an original work by local playwright and Blackout Company member Barney Lopez. His note in the program explains that it started as “an exploration of language.” Perhaps that is the best way to describe it. 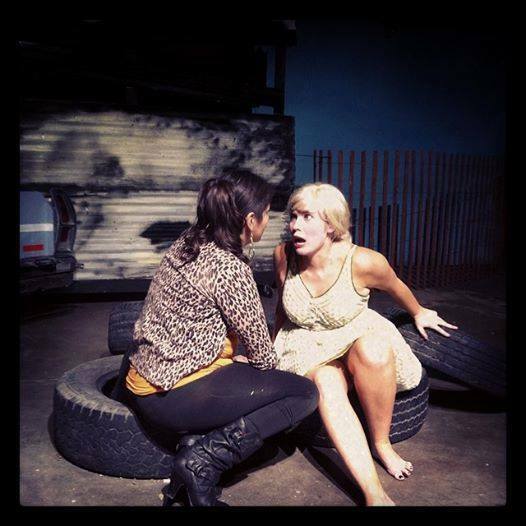 The performance is set in a contemporary trailer park, but the characters tend to speak in archaic poetics and verse. Lopez, however, is not afraid intersperse the often flowery expressions with stark and sudden exclamations of colloquial phrasing and expletives. More often than not, this dissonance creates powerful humor, and also showcases Lopez’s control over his experiment. The poetry makes its own rules as it goes along, as gutsy as it is enthralling. You never know what to expect when each word may glide from an actor’s mouth like delicate finery, or pierce like a violently profane grandparent. This creative risk is worthy enough to warrant ample attention and praise, but it does not stop there. Blackout seems to have an abundance of talent within its ranks. From the technical, to the direction, to the actors themselves, there seems to be savvy to spare. Good thing, too. On opening night the audience was informed that one of the actors, Amanda Machon, would not be able to perform because she was in surgery, and her part would instead be played by the director. Director Katy Andersen performs brilliantly as the ingénue Franny. Her stirring monologue on love, loyalty and union would melt even the most sneering of cynics. Jeff Andersen plays the sympathetic Johnny, expressing all the thought and pain and conflict of a tragic hero. Lila Martinez plays Shauna, a classic go-between with simple and nefarious motivations. Heather Yeocero positively kills it as Pedra, a shallow, venomous, power-mad and vengeful former beauty queen from Texas. Shannon Flynn is 10 feet tall as the insane Dusty. His part is relatively small, culminating largely in a single, titanic monologue, which is riveting beyond belief. Certainly, however, the star is the script itself. The story is unapologetically tragic, allowing the five characters to plot and plan, for good or for evil, but all for the destruction of those closest in the ultimate clash of interests. The dramatic irony inherent in tragedy is the audience’s ability to see the inevitable collapse of the characters miles ahead of the characters themselves, and “Carson Lake” does this splendidly. Not to take away from the bold achievement of the work, but the rising action is startlingly steep and sudden. It’s like a chess game in which the pieces are slowly and meticulously placed and prepared for battle, only for the board to be violently flipped and sent hurtling into space. “Carson Lake” is brave, exciting and, beyond a doubt, necessary viewing. Fri. and Sat. at 8:00 p.m. Sun. at 2 p.m.